Tarmian A, Mastouri A (2019). Changes in moisture exclusion efficiency and crystallinity of thermally modified wood with aging. iForest 12: 92-97. This study aimed to investigate whether aging affects moisture exclusion efficiency and crystallinity of thermally modified wood. For this purpose, wood blocks of hornbeam (Carpinus betulus), Norway spruce (Picea abies) and oak (Quercus castanifolia), modified at 180 °C for 3 hours inside a ThermoWood kiln were exposed to a six-cycle artificial aging procedure. Aging reduced the efficiency and crystallinity of the modified woods. A significant negative correlation was found between the wood crystallinity and equilibrium moisture content (EMC) which indicates that change in the crystallinity index (CrI) measured by X-ray diffraction (XRD) affects the affinity of wood to moisture. The increased affinity of the modified wood to moisture after aging is probably due to the leaching of thermal degradation products as observed by Attenuated Total Reflectance Fourier Transform Infrared (ATR-FTIR) spectroscopy. Effect of sample moisture content on XRD-estimated cellulose crystallinity index and crystallite size. Cellulose 24: 1971-1984. Crystalline structure of heat-treated Scots pine [Pinus sylvestris L.] and Uludag fir [Abies nordmanniana (Stev.) subsp. Bornmuelleriana (Mattf.)] wood. Wood Science and Technology 41: 281-289. Wood moisture content during the thermal modification process affects the improvement in hygroscopicity of Scots pine sapwood. Wood Science and Technology 50: 1181-1195. Influence of process conditions on hygroscopicity and mechanical properties of European beech thermally modified in a high-pressure reactor system. Holzforschung 70 (10): 971-979. One-stage thermohydro treatment (THT) of hardwoods: an analysis of form stability after five soaking-drying cycles. Holzforschung 69: 563-571. Changes of crystallinity in wood cellulose by heat treatment under dried and moist conditions. Journal of Wood Science 46 (6): 431-436. Analysis of dimensional stability of thermally modified wood affected by re-wetting cycles. BioResources 10 (2): 3242-3253. Water sorption properties of thermo-modified wood. In: Proceedings of the “2nd European Conference on Wood Modification”. Göttingen (Germany) 6-7 Oct 2005. European Cooperation in Science and Technology, COST Action FP 1303, pp. 65-69. Structural analysis of photodegradated wood by means of FT-IR spectroscopy. Polymer Degradation and Stability 80: 543-549. Effects of heating humidity on the physical properties of hydrothermally treated spruce wood. Wood Science and Technology 50 (6): 1161-1179. Comparison of the hygroscopic behavior of 205-year-old and recently cut juvenile wood from Pinus sylvestris L. Annals of Forest Science 63: 309-317. FT-IR imaging microscopy to localise and characterise simultaneous and selective white-rot decay within spruce wood cells. Holzforschung 65: 411-420. Effects of extraneous substances, wood density and interlocked grain on fiber saturation point of hardwoods. Wood Material Science and Engineering 2 (1): 45-53. Wood modification: chemical, thermal and other processes. John Wiley and Sons, Chichester, UK, pp. 260. Study of the degradation behavior of heat-treated jack pine (Pinus banksiana) under artificial sunlight irradiation. Polymer Degradation and Stability 97 (7): 1197-1214. Difference of the crystal structure of cellulose in wood after hydrothermal and aging degradation: a NIR spectroscopy and XRD study. Biomacromolecules 11 (9): 2300-2305. Rapid prediction of wood crystallinity in Pinus elliotii plantation wood by near-infrared spectroscopy. Journal of Wood Science 53 (5): 449-453. Effects of aging on wood: a literature review. Wood Science and Technology 50: 7-22. 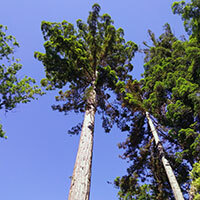 Vibrational properties of sitka spruce heat-treated in nitrogen gas. Journal of Wood Science 44: 73-77. Monitoring wood degradation during weathering by cellulose crystallinity. Materials 5: 1910-1922. Determination of the degree of crystallinity of cellulose in wood by carbon-13 NMR spectroscopy. Holzforschung 44: 351-355. The effects of a heat treatment on the behavior of extractives in softwood studied by FTIR spectroscopic methods. Wood Science and Technology 37: 109-115. Heat-treated softwood exposed to weathering. Journal of Applied Polymer Science 91: 2128-2134. Cellulose crystallinity index: measurement techniques and their impact on interpreting cellulose performance. Biotechnology for Biofuels 3: 1-10. Thermal decomposition of wood: Influence of wood components and cellulose crystallite size. Bioresource Technology 109: 148-153. What is the role of the accessibility of wood hydroxyl groups in controlling moisture content? Journal of Material Science 48: 6352-6356. The effect of wood drying on crystallinity and microfibril angle in Black Spruce (Picea mariana). Journal of Wood Chemistry and Technology 28 (3): 167-179. An empirical method for estimating the degree of crystallinity of native cellulose using the x-ray diffractometer. Textile Research Journal 29: 786-794. The influence of drying temperature on the hygroscopicity of rubberwood (Hevea brasiliensis). Journal of Agricultural Science 2 (1): 48-58. Crystallization of cellulose microfibrils in wood cell wall by repeated dry-and-wet treatment, using X-ray diffraction technique. Cellulose 20: 633-643. Conservation of wood artifacts. Springer, Berlin, Germany, pp. 578. Changes of chemical composition, crystallinity, and Fourier transform infrared spectra of Eucalypt pellita wood under different vacuum heat treatment temperatures. Forest Products Journal 65 (7-8): 346-351. Analyzing reversible changes in hygroscopicity of thermally modifed eucalypt wood from open and closed reactor systems. Wood Science and Technology 52: 889.